Long before I was a Freemason, or a writer, I was a musician. I spent countless hours behind a keyboard perfecting my craft. I played in bands. I played in bars. I played everywhere. One of my first jobs was in a music store. I loved it then, and I still do. I also taught piano for many years. I enjoyed teaching. The vast majority of my students became proficient in playing the piano. A few went much further. A few of my students had that "Aha Moment" like I did as they practiced. For some it happened in a moment as if flipping a switch, and with a few it happened more slowly as their understanding of music and the instrument grew. The aha moment is when suddenly that student stepped beyond just playing the notes written on the page, and started to play music. You become a musician when the music becomes more than notes--when it becomes a form of expression. 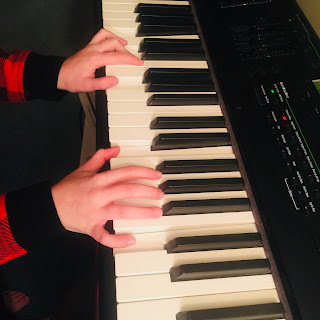 And that's when the student begins to take off, and soon the teacher isn't teaching basic skills anymore, they are teaching the student techniques for turning their passion into music. Very few music students have the aha moment. They learn to read the notes and play the music on the page proficiently. They play a saxophone in the school band, or play the piano in church on Sunday mornings. But music never becomes a form of self expression--for them the piano is a tool, and music is a skill. Not much different than learning to type a letter on a computer. I've had many aha moments in my life. I had it as a piano student the first time when suddenly everything clicked, and if I could hear the music in my head I could play it on the piano. I had it many years later one Sunday morning as I sat in church, when what I'd been listening to week after week suddenly rang true. And I had that aha moment in a Masonic Lodge a year or so after I was raised a Master Mason--that moment when I suddenly realized somewhere between the ritual and what I'd been reading that Freemasonry was much more than a Fraternity. I realized it was a way of life--a life changing path to a happier, more productive and meaningful existence! Like with my piano students from years back, the vast majority of Freemasons will never understand that completely. They'll never have that aha moment. Just like when I was teaching piano, it's impossible to know which ones will, and which ones won't come to that greater understanding of the Craft. We should go about teaching and mentoring every new Mason enthusiastically, because even the ones that never have that "aha moment" will still learn some basic concepts and skills they'll be able to benefit from and be able to use in life. But those few that do truly gain an understanding of Freemasonry as it was intended--well, they'll be transformed and forever changed by it. Those are the teachers, the mentors, the researchers, the writers, and the leaders of tomorrow. Great story. So very true as well. I have been having a lot of those ah ha moments the more I study the work.